Kevin Durant scored 25 points as the Golden State Warriors powered into the Western Conference playoff semifinals with a 4-1 series victory over the San Antonio Spurs on Tuesday. 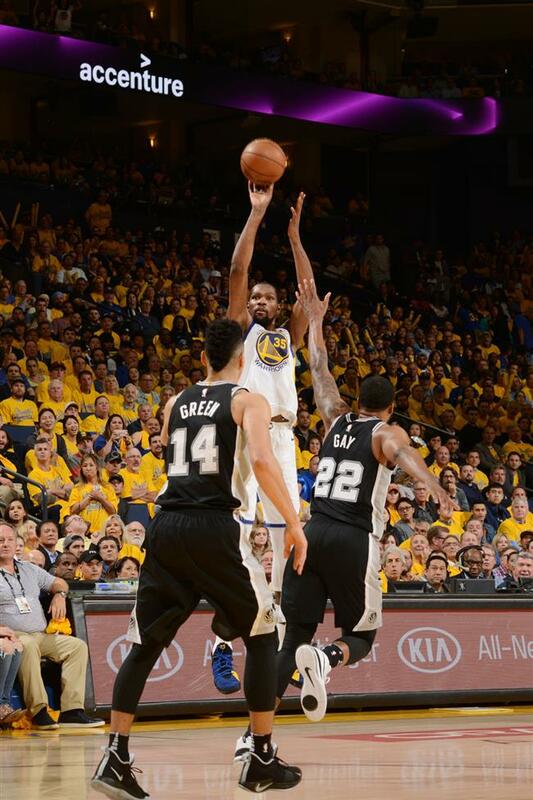 Kevin Durant of the Golden State Warriors shoots the ball against the San Antonio Spurs in Game 5 of their NBA Western Conference first-round playoffs at Oracle Arena in Oakland on Tuesday. The Warriors won 99-91 to advance 4-1. The reigning NBA champions, jolted by the Spurs in Game 4 on Sunday, booked their place in the next round with a nervy 99-91 win in front of the home fans at the Oracle Arena. However, Golden State was given a scare after a late fourth-quarter rally from San Antonio that threatened to take the best-of-7 series to a Game 6. But Durant delivered when it mattered with a superb fadeaway jump shot and 2 free throws to take Golden State clear again as the clock ticked down. Warriors coach Steve Kerr said the Spurs’ battling performance bore the hallmark of counterpart Gregg Popovich, who again was missing from the San Antonio bench following the death of his wife from a long illness last week. Durant finished with 6 rebounds and 5 assists while Klay Thompson had 24 points. LaMarcus Aldridge led the scoring for San Antonio with 30 points while Patty Mills had 18. In the Eastern Conference, the Philadelphia 76ers wrapped up a 4-1 series win over the Miami Heat to progress following a 104-91 victory at home. JJ Redick scored 27 points and Joel Embiid weighed in with 19 as the Sixers set up a second-round meeting against either Boston or Milwaukee. It was the latest evidence of a remarkable turnaround at the Sixers, who just 2 years ago had the worst record in the NBA, with just 10 wins against 72 defeats. Boston, meanwhile, edged into a 3-2 series lead after beating Milwaukee 92-87. Al Horford scored 22 points, 14 rebounds and 3 assists to lead Boston. Khris Middleton led the scoring for the Bucks with 23 points while Giannis Antetokounmpo had 16 points, 10 rebounds and 9 assists. Game 6 is in Milwaukee tomorrow.